The drive unit has a 3.3litre 72hp Perkins diesel engine power source and an onboard twin fan dust collection system. 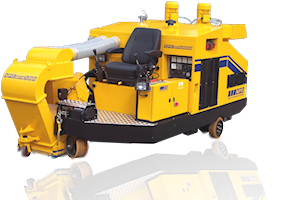 The MP 6000™ drive unit can be fitted with shotblasting (MPB 500™), planing (MPP 500™), grinding (MPG 700™) and stripping (MPS600™) attachments providing a truly multifunctional surface preparation solution. The platform of the MP 6000™ has been fully optimised in terms of power to weight ratio and the hydrostatic high torque drive system allows the machine to turn easily on its axis.